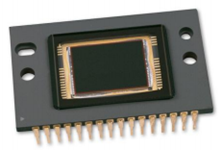 The KAI-2020 Image Sensor is a high performance 2-million pixel sensor designed for a wide range of medical, scientific and machine vision applications. The 7.4 ?m square pixels with microlenses provide high sensitivity and the large full well capacity results in high dynamic range. The split horizontal register offers a choice of single or dual output allowing either 18 or 35 frame per second (fps) video rate for the progressively scanned images. Also included is a fast line dump for sub-sampling at higher frame rates. The vertical overflow drain structure provides antiblooming protection and enables electronic shuttering for precise exposure control. Other features include low dark current, negligible lag and low smear.